I say Instagram Stories and John “Colderice” Lawson is ready to jump into it on the latest edition of This Week in Small Business. We kicked off this week’s show by talking about one of my favorite recent articles from Small Business Trends. This one from Alex Yong in which he interviews rising entrepreneur Nicholas Kirchner, who at 21 already owns his own marketing agency, got John going right away. I temper John’s enthusiasm a little when I put him on the spot — which should small businesses focus on more: Instagram or Facebook? Or both? “I’m starting to skew Instagram a little more over Facebook,” he says. To find out why John thinks you may want to spend more time on your Instagram marketing efforts, check out the full show above. We also discuss the even earlier Christmas shopping season — and how your business should respond — as well as how you can keep your expenses to a minimum while you’re on the road for business. To get notifications and updates when another This Week in Small Business goes live, be sure to subscribe to the Small Business Trends YouTube channel today. The American Trucking Association just announced its advanced seasonally adjusted For-Hire Truck Tonnage Index rose 1.9% in July. And a portion of this includes work going to the nation’s small independent truck operators. July 2018 Trucking Industry Statistics According to the association, the index showed a noticeable increase compared to the 0.5% decline in June revised from 0.4%. The way people save for retirement is shifting, particularly when it comes to employer sponsored retirement accounts. Today’s employees, millennials in particular, like to have control over their money rather than contributing to accounts set up by their employer. They also aren’t as likely to stay with the same employer for their entire career as those in past generations have done. The fourth annual Adobe Consumer Email Survey has revealed consumer use is up 17% year over year. This is despite the fact there are now more channels available for consumers to interact and engage with their favorite brands. The survey points out consumers are checking their personal email an average of 2.5 hours on any given weekday. This is in addition to spending an average of 3. While digital technology has improved commerce, it has also increased the complexities of the sales funnel. LinkedIn has introduced a Pipeline Management Kit for salespeople so they can remove blind spots from the modern sales process and manage the difficulties of B2B sales. Small businesses are always looking for ways to have a competitive advantage in the market. Now they are not only competing on price and customer service, but also on speed. According to a recent report by Go People, a Sydney-based on-demand delivery and courier startup, 65% of retailers will provide same-day delivery services by the year 2019. The trucking industry is undergoing a huge transformation with the integration of digital technology. Uber Freight is pushing this transformation with a new platform designed to connect shippers and carriers of all sizes more efficiently. Digital technology has upended the way we work and where we can work. And a new survey from AND CO and Remote Year has some insightful data regarding the state of remote workers in 2018. According to the survey, 55% of the respondents said they worked remotely 100% of the time. The need to organize, manage and preserve a vast number of invaluable digital assets is paramount for any business. And this is especially true for small businesses lacking the time or manpower to stay perfectly organized. Who can remember 1995? Millennials born in the 1990s won’t remember that year, when the STS-71 Space Shuttle mission was launched to dock at the Russian Mir Space Station, and an unprecedented heatwave engulfed the Midwest, which saw temperatures exceed 104 degrees Fahrenheit for five consecutive days. Nor will they remember Windows 95. With the launch of Splashtop Business Access Solo and Pro, Splashtop is expanding its offering of remote access for business professionals and teams. Splashtop Business Access Individuals and teams will now be able to access remote computers securely on Windows, Mac, iOS, Android and Chromebook devices. No matter where you live in the world, tax time is always a stressful time of year. In fact, one EU study found that over half of all taxpayers, private and corporate, began stressing the closer it got to the time they had to lodge their returns. Even sites like news.com.au offer tips on how to alleviate much of the stress that mounts the closer you get to tax season. If you suffer from tax season stress, here are a few tips that could help you step away from the 50 percent of taxpayers who throw up their hands in despair each year. Although 28 February is still half a year away, many Australians are already stressing over how they will file this year – and whether or not they will have the money to pay a professional tax specialist. The worst thing you can do is to avoid ‘thinking’ about taxes until the last moment. Keep your records updated regularly so that you have all your ducks in a row come lodging day. It’s easier said than done when being advised not to worry about costs associated with tax preparation, but there really is a way to avoid the high cost of consultations. Why not file your tax return online at much less the cost of a brick-and-mortar accountant or tax specialist? Altogether too many people are already living hand to mouth even though the global economy has improved since the Great Recession but lodging your return online can save you a significant amount of money. Another reason so many people stress is that they haven’t slotted in time for keeping their records straight. Lo and behold, tax season arrives and it’s a mad dash to find all those receipts and invoices they failed to file accurately. If you schedule even an hour a week to go over the week’s paperwork and then file it accordingly, you will not experience the stress that comes as part and parcel with the ‘hunt.’ Some accountants suggest that you also scan every receipt and invoice so that you have a digital file in the event some catastrophe claimed your hard copies. From time to time, the government may institute changes which could affect the way in which you file, the deductions you can claim, and other items important to filing your return. According to the Australian Taxation Office, the latest data showed that the average return was approximately $2,300 AUD last year and that is certainly nothing to stress over! However, if even the smallest change in their regulations alters the way in which you claim and lodge your tax return, you could encounter a significant wait whilst your return is denied until you make the appropriate corrections. How much stress can these tips alleviate? By making fewer errors and better use of your time, you will not be subjected to the same degree of stress when it comes time to lodge that return. In other words, the best way to avoid tax season stress is to consider every season tax season and keep up with your records. In this way, you will be prepared when the end of February rolls around. 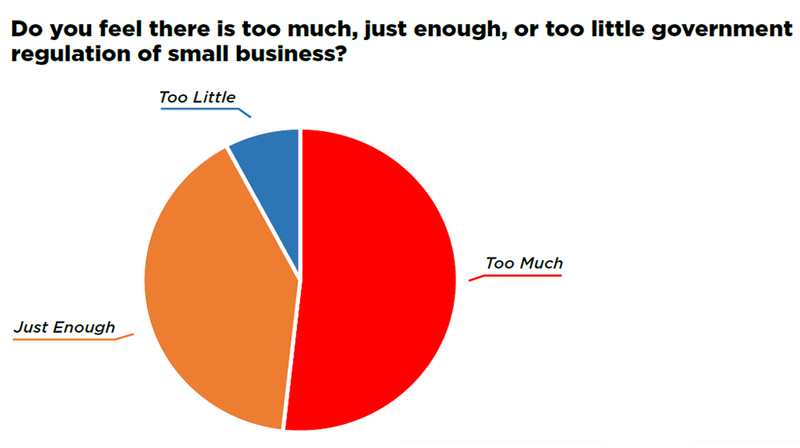 The Bi-Annual Trends Report from Small Business Expo was just released, and more than half or 51% of respondent in the survey say there is too much government regulation. The report looks to gauge small businesses sentiment to gain insight into the challenges and trends currently affecting this segment. This is the first of the bi-annual reports, and the data represents what has taken place in the first half of 2018. The impact of regulations is disproportionately higher for small business owners. According to the US Chamber of Commerce Foundation, the cost of regulations to small businesses with 50 employees or less is almost 20% higher than the average for all firms. While the Trump administration has gotten rid of many regulations, small businesses owners still feel the impact of some of those remaining on the books. It is important to note just as the Small Business Expo survey points out, businesses owners agree with many regulations. Forty-two percent of the owners say there are just enough regulations along with another seven percent who say there isn’t enough. The problem is the consequences of the regulations are more severe for small firms. The data for survey comes from 400 U.S.-based small business owners across industries in retail, manufacturing, education, non-profit and government agencies. Small Business Expo has the largest small business networking and educational events with more than 100,000 small business professionals and entrepreneurs participating every year. 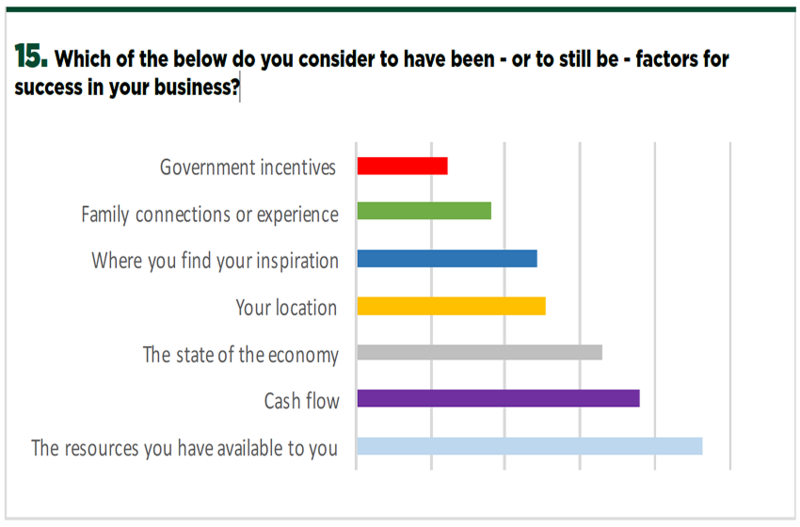 When it comes to the current administration and its support for small businesses, only 30% of the respondents agreed. Almost half said they disagree or strongly disagree, with a little over 20% staying neutral on the issue. At the same time, more businesses owners are confident about their business, with over 60% agreeing or strongly agreeing with this sentiment. This is being driven by the current state of the US economy as indicated by 42.5% of respondents who said it is a factor in the success of their business. And an almost equal number or 41.4% said they feel optimistic about the future of the US economy in the next 12 months. As to what they consider to be the factors in the success of their business, the majority said the resources available to them. This was followed by cash flow, the state of the economy and location. You can look at the rest of the data in the survey here (PDF). AFP – Two people were injured during a stabbing incident at Amsterdam’s busy Central Station on Friday morning before the alleged attacker was shot and wounded, Dutch police said. The two injured people and the knife-wielding suspect were taken to hospital, Amsterdam police said. Trams, which leave from the front of the station were not running, the police added, saying more information was not immediately available. The station is located on the Dutch capital’s historic canal-ringed city center. BERLIN (Reuters) – The European Union’s chief executive said on Friday the bloc was set to end the practice of switching between summer and winter time after a survey found most EU citizens against the practice. The group can be considered acceptable as the German team is the main favorite. Zurich is the winner of the Swiss Cup and is therefore entering directly into the LE teams. AEK Larnaca is also the winner of the Cyprus Cup. To reach the group stage they won against the Irish Dundalk (0:0 and 4:0), Sturm Graz (2:0 and 5:0) and FC Trencin (1:1 and 3:0). The games in the group will be played on September 20, October 4, October 25, November 8, November 29, and December 13. You are currently browsing the Business, finances, forex blog archives for August, 2018.